Just another gang banger and another senseless death. 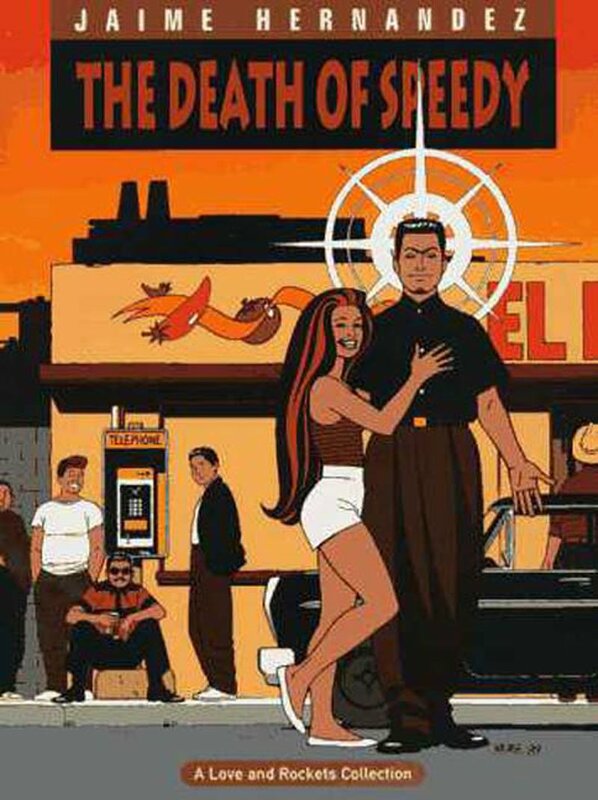 In 2017, that’s one possible reading of Jaime Hernandez’s 1986 “The Death of Speedy,” which appeared in the first volume of Love and Rockets. In 2017's Chicago, where our shootings and deaths are now a part of our local and national news, Hernandez’s story looks almost quaint now, a more romantic view of innocent love, young turks and the many rivalries that are caused when those lovers and turks collide. Sooner or later, everyone falls in love with Maggie, the center of Hernandez’s comic world. In “The Death of Speedy,” we see the early hesitant steps of one love affair and the tragic end of another. 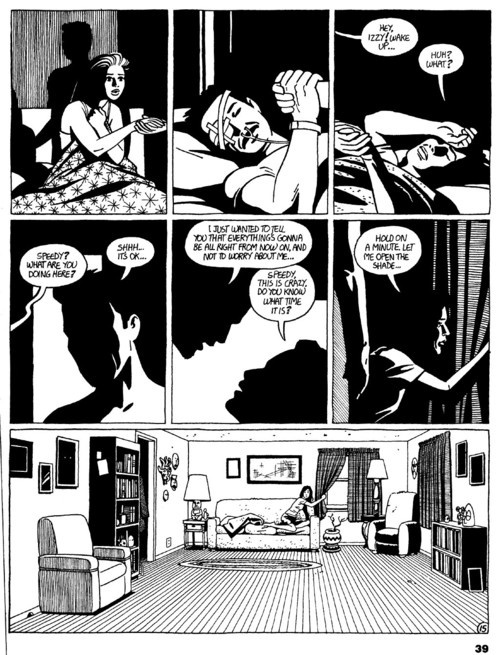 When you look at all of the stories that Hernandez has done since “The Death of Speedy,” you can see how pivotal those moments were in Maggie’s life even as she avoids dealing with her pain from it except for in her most vulnerable moments. This story takes place when Hopey, the turbulent rock of Maggie’s life, is missing. As one of the great love stories in all of comics, the tales of Maggie and Hopey ends up being more about that love when the two are separated both geographically and emotionally. Strangely, Maggie and Hopey’s stories are never about the absence of love but about the distance of it. So at this point in their stories, Maggie is at home in southern California, surrounded by the remnants of her childhood which includes a rebellious younger sister, while Hopey is off on a cross-country tour with the soon-to-be-broken-up band The Jerusalem Crickets. This Hopey sized hole in Maggie’s life leaves a vacuum for the past to fill. Trying to fill that void are two young men from her childhood growing up in Hoppers, Ray Dominguez, and Speedy Ortiz. And like everyone else, both are in love with Maggie in their own ways. Ray is the prodigal son of Hoppers, having returned to his childhood home and friends after being away at art school. Speedy is a pretty much a boy, the brother of one of Maggie’s best friends, who is caught in the middle of a percolating gang war with Dairytown where Esther, Maggie’s sister, is visiting from. So here’s Maggie without the love her life, caught between two very different men, one who views her as a link to his past while the other thinks her love will be his salvation. Maggie’s relationship with Ray D. will be a long one that ends up being a series of missed opportunities culminating in near tragedy in Hernandez’s 2014 The Love Bunglers. 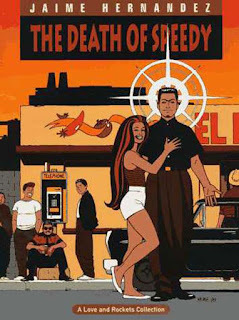 But Speedy’s story is a quick flash, about 70 or so pages buried in the decades of comics that Hernandez has produced. And the title of this sequence of his Locas stories is probably a pretty big spoiler but it’s actually a subtitle. The full title is “Vida Loca: The Death of Speedy.” Years later, thanks to Ricky Martin, we’d be singing about living the “Vida Loca” to a pop Latin beat but for Hernandez, the vida loca is not something to be celebrated in song. Hernandez tries to show that no matter how much these young men and women may think they are older and responsible, they’re all really just kids pretending at being adults. Esther thinks she can juggle lovers on both sides of the gangs without any repercussions. Ray believes that he’s above the gang rivalries that his friends have never been able to escape. Speedy, like Esther, thinks that he can fool around with a number of women’s hearts without creating any of his own fields of war. Even Maggie thinks that as long as she keeps her head down and her heart pure that she can’t get hurt. If she’s going to be either Ray or Speedy’s refuge, her own refuge Hopey is out there somewhere, waiting for her. 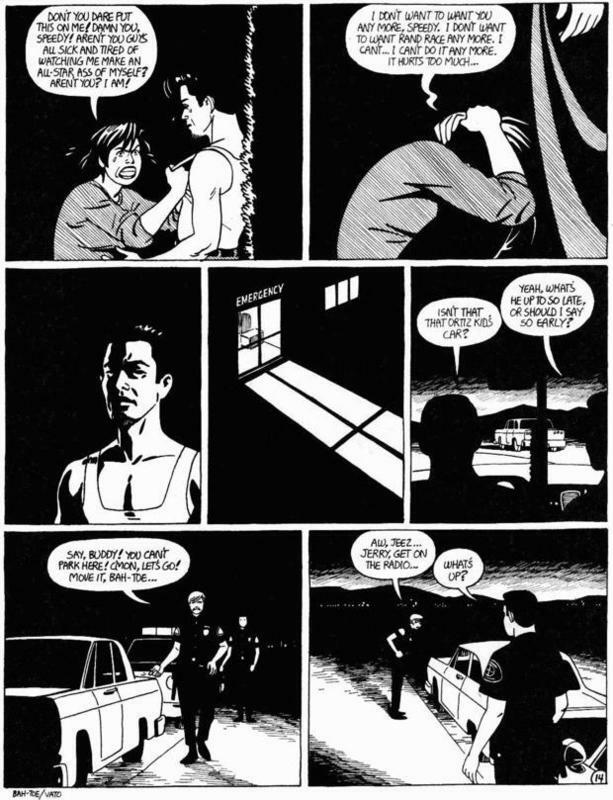 On the next page, Hernandez shows three characters being visited by a vision or a ghost. With one hand, Esther clutches at her bed covers even as she grabs the vision’s hand. ‘Litos, Speedy’s friend who was shot, lies in a hospital bed, visited by the ghost. And Izzy, Maggie’s good friend and Speedy’s sister, was asleep on her couch as she saw or dreamed Speedy standing over her. “I just wanted to tell you that everything’s going to be all right from now on. And not to worry about me…” And when she turns on a light to get a better view of her brother, she’s alone in her living room. Izzy’s grip on reality was always tenuous at best but the death of her brother is something that she’s never quite recovered from. It’s wonderful how these three people, all with their own unique relation to Speedy (lover, brother-in-arms, and sister) are visited by this reassuring presence. The final page is an oddball unofficial epilogue to the whole affair, flashing back to a Hopper’s wedding, where Ray and ‘Litos serve as groomsman, Maggie and a friend flirt with the boys, and Speedy is still just a kid, getting underfoot as he tries to scam some beer off of the older guys. It’s such a simpler and more innocent time where we see these characters as the kids that they are. Even though we’ve now seen how their lives unfold as they get older, there’s a strong sense that they haven’t grown up since this wedding. The way it’s added onto the end of this story, showing a much more carefree time in these people’s lives, leaves us maybe with a better image of these characters than the story itself does. For all of the tragedy that happens in the final pages of this story, Hernandez gives his audience this moment of happiness and levity as if he’s wanting to remind us that these characters aren’t just the gangs and fighters that we’ve just seen. There are dimensions to their lives and this final page gives the reader a new light to see these characters in. So much has happened in Maggie’s life since the death of Speedy. She found Hopey again but their love has become something different, maybe purer but not as bright or burning. Ray has been in and out of her life and had so much change because of Maggie, and not always for the better. Maggie and Ray’s love for each other is just as pure as Maggie and Hopey’s but has a whole different essence to it. Ultimately, Speedy was a moment in Maggie’s life but it’s shaped the character that she’s become over the past 30 years. From mechanic to punk to apartment manager and back to mechanic, the great thing about Jaime Hernandez’s portion of Love and Rockets is that we’ve gotten to see these women and men grow up, make mistakes and learn lessons (some of them the right ones and many of them the wrong ones.) And we, the readers, get to how these moments like the death of Speed alter the trajectory of these characters lives. 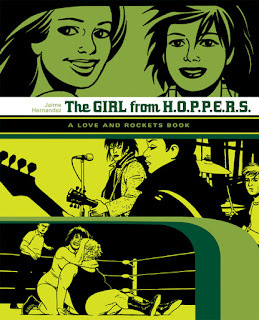 Note: The Death of Speedy is currently collected in Fantagraphics Love and Rockets Locas Book 2: The Girls from H.O.P.P.E.R.S.